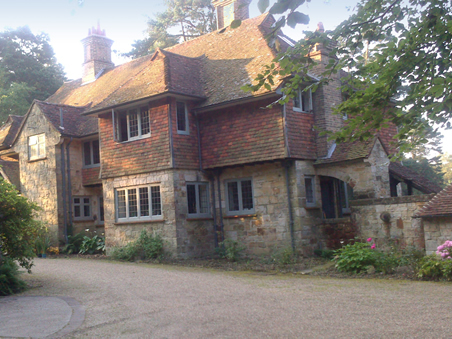 Fairstowe B&B in Crowborough offers luxury bed and breakfast accommodation on the edge of the ancient Ashdown Forest. An overnight stay in this beautiful Arts and Crafts Edwardian Country House offers comfort and tranquillity in the Area of Outstanding Natural Beauty in the High Weald. It was the location for BBC's 'Christmas of my Lifetime' with Len Goodman and 4 celebrity guests in 2014. The area is semi-rural, wooded and tranquil. Fairstowe lies within one mile of the centre of the small market town of Crowborough, East Sussex, on the edge of the Ashdown Forest, home of Winnie the Pooh. The area is popular with cyclists, golfers, walkers and birdwatchers, those visiting family or friends or on business. A variety of eating places can be recommended nearby and Fairstowe is 7 miles south of the spa town of Tunbridge Wells with it's many shops, restaurants and cafes. Local attractions within a short distance include Groombridge Place, Penshurst Place, Hever Castle, Standen, Batemans, Chartwell and Glyndebourne. There are also beautiful gardens nearby including Pashley Manor, Sheffield Park and Scotney Castle. Great Dixter and Sissinghurst are a little further. Gatwick airport is 45 minutes away by car and Crowborough train station is a 7 minute drive. Fairstowe is close to the A26 which connects Tunbridge Wells to Uckfield and Lewes to the south. Bridget and Jim provide a very warm welcome to their guests so that their stay is pleasurable and relaxed.